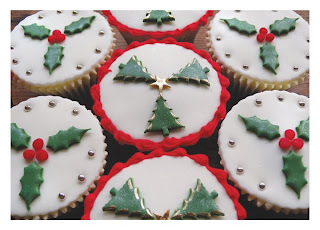 Epiphany Cupcakes: Christmas is coming... no really, it is! So, here they are, chocolate sponge, vanilla buttercream, and seasonal decorations. They took me ages to make as I hand-painted gold snow onto all the little Christmas trees, but they are so pretty it was worth it. Once the cards are available to buy I'll add a link. Love these! perfect for the upcoming season! I would just like to say thank you for leaving a lovely comment on my blog!